With its roots firmly in the distant past, Phitsanulok offers guests a vista into the "real" Thailand. Phitsanulok Airport Car Hire has the ideal rental deal with convenient pick-up when you land! Phitsanulok Airport (PHS) is located just south of the city of Phitsanulok, and is serviced primarily by Nok Air, with daily flights to and from Bangkok. This makes Phitsanulok an ideal place to hire a car when visiting the area. CarHirePhuket.com provides travellers to this mid-country region with the widest selection of vehicles to choose from, and at the best rates in the province. Start your search now by filling your hire dates and sit back while we compare real-time offers from top Thai rental providers operating at Phitsanulok Airport to find you the best hire deals for all classes of vehicles. Phitsanulok Airport (PHS) shuttles travelers to and from one of the oldest cities in the country, as Phitsanulok dates back some 600+ years, and is best known historically as the birthplace of King Naresuan, who freed Thailand from Burmese rule back in the late 16th Century. Centrally located within the country, today’s Phitsanulok is an important political and strategic hub, as it was once the capital of Thailand during the reign of King Boromma Trailokanat of Ayutthaya. Phitsanulok is home to several universities, as well as to one of the largest Royal Thai Army bases in the nation. 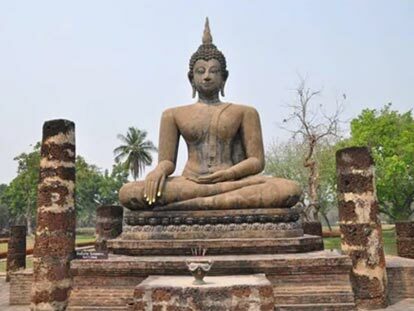 Visit the nearby World Heritage Site of Sukhothai. This site is a historical park that is a walled city about 2 kilometers by 2 kilometers with over 190 ruins dating back to the 13th Century and was the first capital of the Siam Empire. 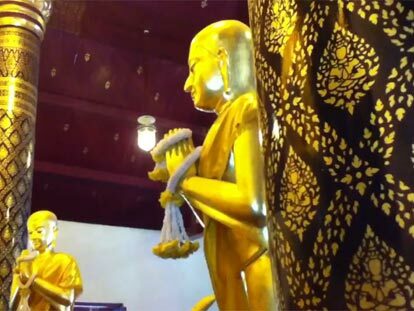 To see how Buddha statues are cast these days, visit the Buranathai Buddha Foundry, which is a unique foundry in the province that specializes in the reproduction of bronze Buddhas – visitors are allowed to walk along the production line! Another unique stop in Phitsanulok is the Sergeant-Major Dr. Thawee Buranakhet Folklore Museum, which houses a collection of folk art, local baskets and pottery, as well as other utensils to include antique traps used to catch snakes, tigers and porcupines. For a more contemporary exhibit, see the Naresuan University Art and Culture Gallery for hundreds of artistic works from important contemporary Thai artists. Find other ideas and guides on Phitsanulok travel guide and Wikitravel Phitsanulok guide.